I finally did it. I finally finished all the books in Phillip Pullman’s His Dark Materials trilogy. Let me start by saying that I listened to the audio books for all of them, and they are superb. It’s a full-cast production with Pullman as the narrator, and he has the perfect voice for his stories. It can be hinky letting the author do the reading, but in Pullman’s case it felt like the most authentic interpretation of the books possible. He could read the phone book to me and I’d be hooked. I’ve been working on these books for a long time (with lots of other books in between). 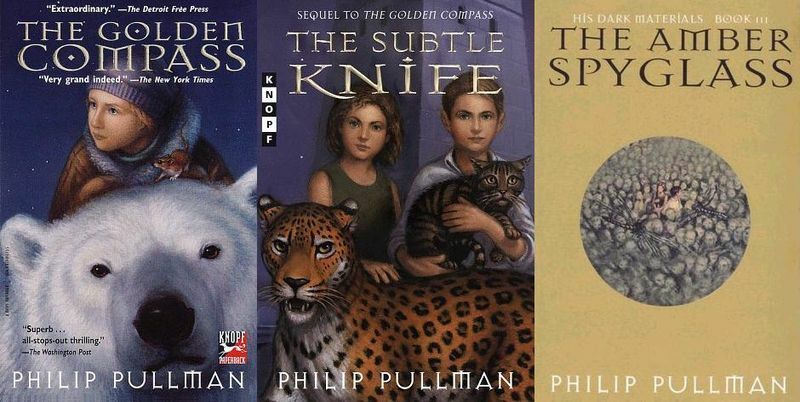 I finished The Golden Compass back in July of ’08, and I just finished The Amber Spyglass last week. I thought they all had great build up to the finale of the series, but I will say that so much happened in The Amber Spyglass that at times I had trouble keeping track of which character was which. I felt that Mary Malone’s plotline was too meandering during much of the book, and it wasn’t until about 3/4 of the way through that I really got so excited I didn’t want to stop listening. Of the 3 books, The Golden Compass has to be my favorite simply because I love Iorek Byrnison and the armored bears. I thought his relationship with Lyra and his determination to help and protect her were some of the more exciting elements. All of the books were impressive, but he was my favorite character.